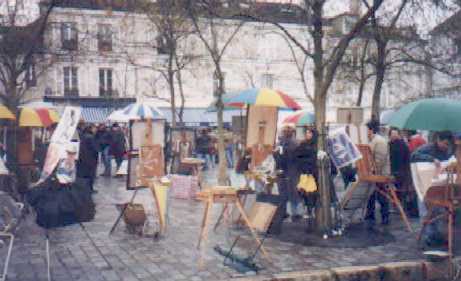 Place du Tertre - The painter's square! Overlooking Paris on the hill to the north is the Roman-Byzantine basilica of the Sacred Heart. dominates Paris. The church is on the site where Saint Denis was beheaded because of his faith in late IIIrd century. 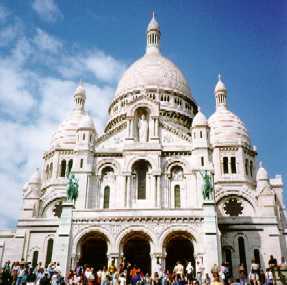 The basilica's construction was financed by every parish in France. In 1875, work began. Unfortunately, with the breakout of the First World War, the consecration planned for 1914 had to be postponed until after the war. The building's extraordinary whiteness is a result of the material used in its construction: Chateau-Landon stone bleaches with age. The front has two bronze equestrian statues of St. Joan of Arc and St. Louis by H. Lefebvre, and the climax of the overall design is the statue of Christ, his hand raised in blessing. Since 1885, the prayer of perpetual worship has been the most important part of the life and activities of this worldwide famous sanctuary. Follow the signs to the west of the Church to Place du Tertre. This is the artist's square. It is fun to walk around except for the artists who are constantly trying to get you to let them draw a portrait of you. When you walk from the subway station to Sacre Coeur, you will walk through the Montmarte flea markets. This is alot of fun if you like that kind of stuff. 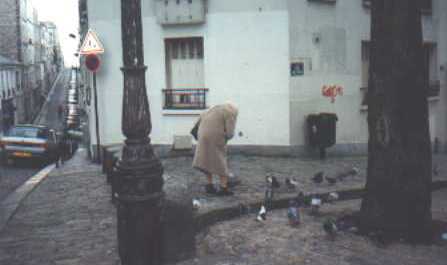 When I went to Montmarte with my wife we started our walk early in the morning at Place Blanche. The Red Light district was dead at that time. We followed a walk that was written up in a Fodors guide I picked up. 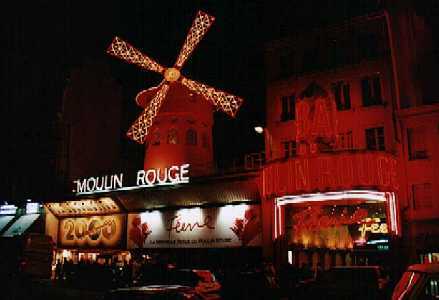 That's the Moulin Rouge on the left which is right at the Place Blanche subway station. That's me by the fish on the left. 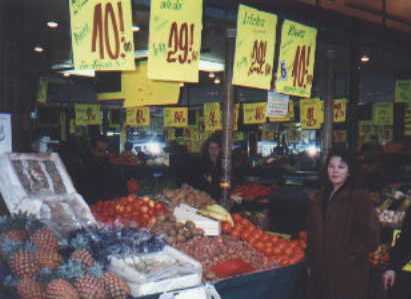 There were alot of fruit and vegetable stands there too. I took this picture and sent it to my Grandpa. 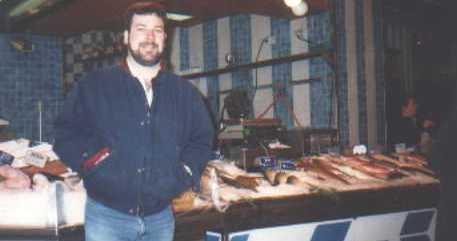 He used to own a fruit and vegetable stand and I know he got a kick out of this picture. This is kind of a corny picture so I will tell you my wife took it. 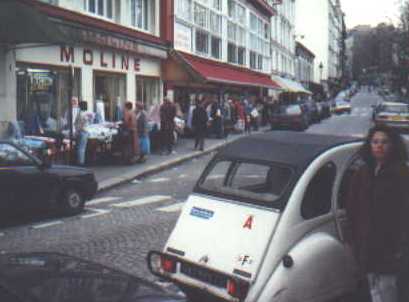 Here's a picture of one of the flea market streets in Montmarte.